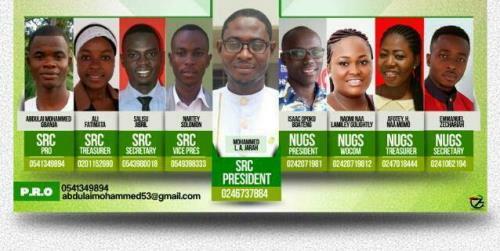 Troubles have erupted at UDS Wa Campus after the executives of the Students’ Representative Council (SRC), H. E Mohammed L.A Jarah the SRC President was called to account (achievements) to the students body so far what he has done within the 7months he was given the mandate to lead the students body as the mouthpiece of the students. This was the directive of the Vice Dean of students to probe into the dealings of their current SRC president. L.A Jara​ on 26th March, of 2018 at the auditorium where he was called to meet the student body and give account on how their monies have been spent so far through a petition raised by some concern students. Things didn’t go well as expected, “when two elephants meets the grasses suffers the most”, H.E Jara however, attacked one of the students verbally and attempted slapping him, he was held back by his own executive members. “We have written a petition to the SRC president to come out boldly and tell us what he has used the monies for! There are many things on campus we want to do with our money. We contributed all our monies to pay SRC dues and they used the dues anyhow,” a student lamented. Angry students chorused repeatedly, those dues were taken to develop the university as a whole. We concern students have intend to wage an open demonstration if our demands are not met. The disappointed students, thousands in their numbers are not deterred by the threats. Demonstration will surely take place if management fails to resolve this matter without delay. This is the case 95% of the over 4,000 students of the Wa UDS Campus are angry and hot about. It’s either he comes out clearly to tell us what he has used the money for or he gives us our money back without any further explanations. “It has always been a natural phenomenon that our leaders assume office, handle things their own way without informing us what their achievements or challenges are and leave office to enjoy life with our sweat and this has been so possible because we don’t demand anything from them. For the past 3 years now, the only visible project that have been done and seen on our campus is the basket ball court that was done under the belt of Bernard Amoh who equally throw dust into our eyes (students) and took away a lump sum of money that was to be used to register our school radio, and the refurbishment of the Ultimate radio under the leadership of Nicholas Amoah. Our leaders must be told of “VALUE FOR MONEY” as a characteristics of money. We keep paying SRC dues every year but we don’t know anything that has been made from these monies contributed”, Mr. Philip Omeano ICD level 400 student revealed. He therefore found it necessary that the students body come together and set a precedent that the next generation will follow and do the right thing. With this notice he encouraged every student to come around and channel their grievance to the SRC president. “I hereby mention that I forbid to be a witch hunter to this current administration but I believe in doing the right thing without fear and panic because when the right thing is done no single soul would rise against it”. I strongly believe that one day UDS,Wa Campus would change from invisible project to visible project. If it must be done, it must be done well because we are the ambassadors to this great university (UDS), he angrily said. March 29, 2018 in Business.